Weddings are much different than they used to be and there is a lot more to them than simply the timing and logistics. Most couples of our generation are as concerned with making their wedding their own as they are with creating a meaningful event for family and friends. I am seeing more and more brides that want the groom to be reflected in the wedding just as much as she is (a move I am all in favor of!). But often times, clients come to me with little design sense and a left operating brain and wonder what they can do. There are many ways to go about making your wedding a reflection of both your unity and individuality such as: the ceremony, the type of food and drink served, the time of year, the music played, the activities planned, and more. But there is another way to make your wedding uniquely yours outside of the practical and necessary, and that is through design, decor, and aesthetic. Toward the end of last year, I decided to start offering design packages to clients as an experiment. I wanted to see if there was a need for wedding design in our market and I also wanted to gauge potential client's interest in it's benefits. I have found that more clients than I originally expected have wanted assistance in this department. We creatives often take for granted the way we think and forget that some people utilize a completely different side of their brain (you know the people that can do math in their head without needing 18 calculators and will probably figure out how to save our environment). Wedding design packages are great for the super organized bride that wants to plan the wedding herself but is in need of a little extra help pulling the aesthetic together or for the busy bride who simply does not have time. There are lots of benefits in booking one of my design packages and today, I would like to share some of those benefits with you. I have worked hard at creating a unique process for determining each of my couple's individual and collective styles. There are several different stages to this process, but it is a highly valuable part of my work. The results give me a starting point for our time together and also help me to cater my concepts to each couple. I can't tell you too much on how the process works (a gal can't give away all her secrets can she?) but I will tell you that is a way for you and your partner to work together as a team and it is fun! Once I determine your style and tastes, I then set out to create custom mood boards. I have a background in graphic design and use some of my design software to pull together a custom "look" for your wedding. You will then select the board that is your favorite and we will tweak it until you end up with something you love. Once you have your final board, this will be your inspiration for all your wedding planning decisions going forward. This concept will help you in determining bridesmaid dress colors, suit options, floral selections, linens, stationary, decor pieces, and so much more. You can pull your board up and refer back to it at any time through each decision making step along the way! an example of a mood board I created for a client. Another benefit in having an event designer is their ability to connect you with vendors that fit within your aesthetic. Once we have your mood board finalized, then I can pull out my list of vendors and connect you with the ones that best suit your design needs and your budget. The Pinterest Board is a key component of the design process. I will manage the board for you and will pin images that fit within the style we have created. You then have an opportunity to interact with the board by leaving comments, "liking" images, or pinning images that you find while you are scouring Pinterest on your lunch hour (okay while you are supposed to be working on that long overdue TPS report but same difference). 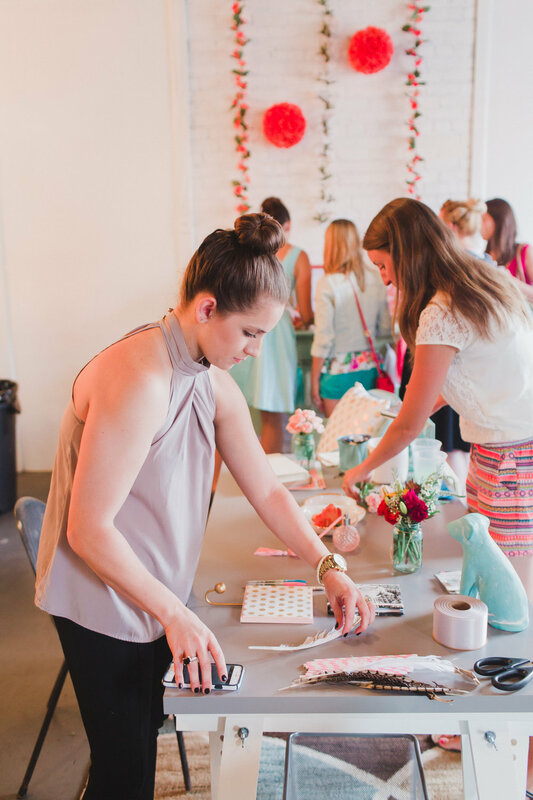 The Pinterest board is also something you can share with other vendors or your bridal party to help them understand how to work within your style. Depending on what package you select, you may also receive some design consultations. During these consultations, we will go over suggestions for how to pull in decor pieces and where to go to find the best deals. In addition, we will talk about how to work with your different vendors to bring your look together. We will discuss linen selections, centerpieces, place settings, guest book options, and more. Finally, we will create a mock up of your ceremony and reception site for you to use as a guide going forward. Some packages come with modified planning services like a wedding planning timeline creation, budget assistance, a custom day-of itinerary, and access to my professional event planning software. So hopefully this gives you a little more insight into my design process and what I offer to my clients. To see examples of some of my past design work that has been featured on national lifestyle and wedding publications, head to the sidebar on the blog. To schedule a complimentary consultation or to learn more about Maggie's Misc, visit the link below and fill out the contact form. A few weeks back, I received an email from Whitney Trevillian, one half of the two part duo that makes up Handspun Cinema (her boo Josh makes up the other part). She asked me if I would be a stylist in a free mini styling workshop that they were hosting alongside Paisley and Jade and Annamarie Akins right before the upcoming Tuesdays Together meeting (if you are unfamiliar with Tuesdays Together, check out the Rising Tide Society website for more information). My initial reaction was two parts: one part honor and one part intimidation. I was honored and humbled that they had asked me to be a part of something like this, but I was also (admittedly) somewhat intimidated to be working along side two other very skilled and distinguished planning/styling brands here in Richmond. If you know me then you know I often focus on areas in my life and business that have room for growth versus areas that are already strong. What can I say? I am always trying to improve myself. However, with the encouragement of my husband, parents, and a few friends I decided I would be a part of it. It did sound fun. 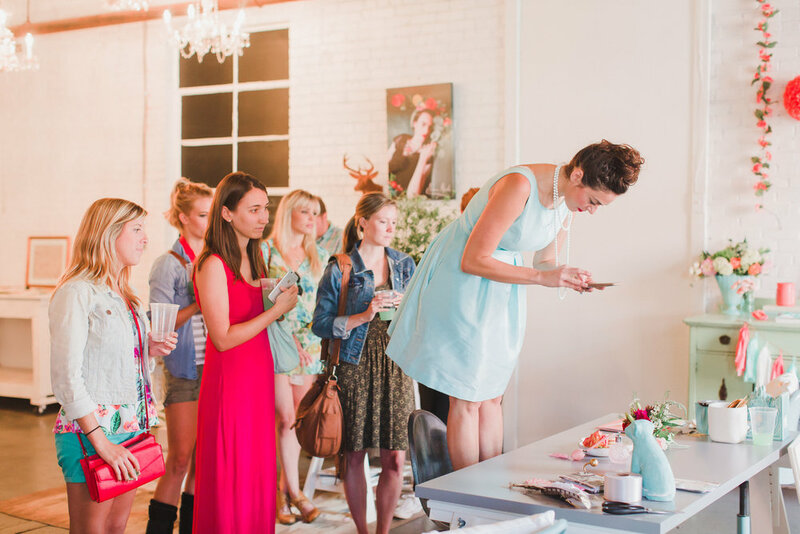 The whole idea behind the workshop was to give creatives (photographers, planners, florists, designers, writers, and more) in the Richmond market an opportunity to learn how to style for Instagram and photo shoots. Each of the companies represented have very different brands and styles and so we were each asked to bring styling materials that were representative of our aesthetic. Whitney described the Maggie's Misc aesthetic as soft and romantic. 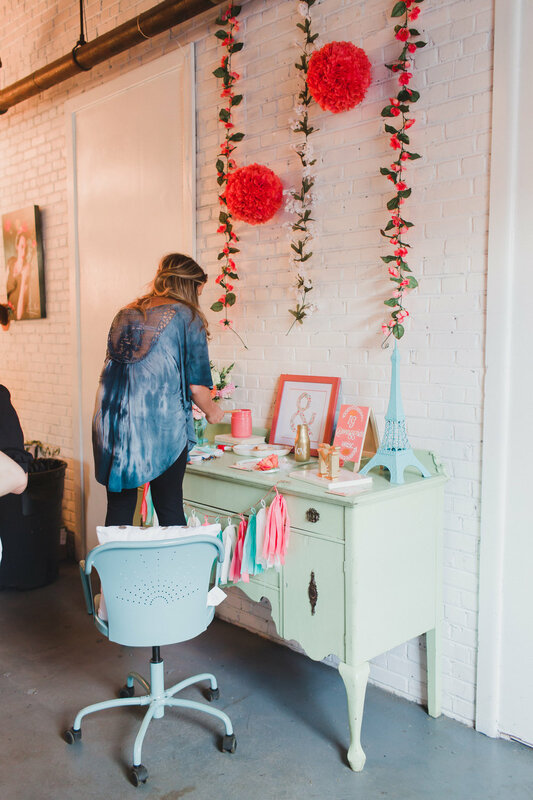 *Swoon* Each of us would then have a styling bar at Paisley & Jade on which we could talk with attendees, give them tips, and let them work. The workshop was from 3:30 - 5:30 and we each arrived around 2:00 for set up. There were three stylists represented (including Maggie's Misc), a florist, and three stationary companies. Once all the attendees arrived, they were split up into four groups. The groups then alternated between stations. Each group was at each station for 25 minutes. At the very end of the workshop, they then had the opportunity to style with the materials each of us had contributed. 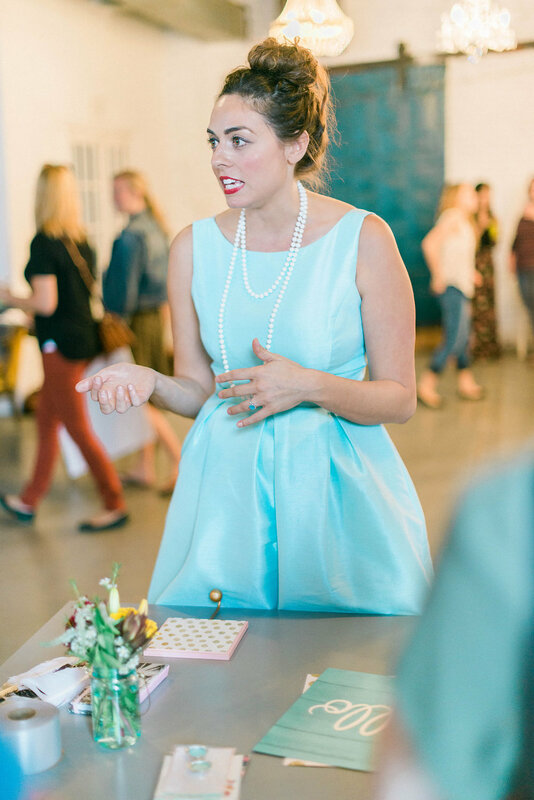 I talked to the attendees about the three C's of styling. Concept. Composition. Continuity. I shared with them information I learned from my time as an Art History major in college along with information I have received as a part of some continuing education. However, a majority of my design skill is self-taught (isn't it funny how things like this can make you insecure?). The workshop was a lot of fun. The attendees seemed excited and it was great seeing so many different types of businesses and people in one location. I got to see old friends in the industry while making new ones all at the same time. The lesson I took away from this experience: Don't let intimidation keep you from pursuing something good. As I mentioned before, prior to the event I was experiencing insecurity and intimidation at the thought of be represented along side two other amazing companies. I was the newest stylist of the three and therefore the least experienced. However, it was a great honor to be involved and a wonderful learning and confidence building experience for me. Sure, I may not be as far along as others in the industry in terms of styling or social media presence, but we all have to start somewhere. The old adage rings so true dear friends, comparison truly is the thief of joy. We are all at different places. Some of us are just starting out on our journeys. Some are farther along. And some are very experienced. But the truth is that there are highs and lows, joys and struggles at each and every stage. No one has it all figured out and you know what? That's okay. If we did, we wouldn't seek God in the process. He has created each and every person for a different purpose and no one can accomplish what you were made to do. One of the most loving things God has done is to make all of humanity unique. I am just thankful that I get to be even a little part of this industry. I am thankful that I get to do what I do everyday. I am thankful for a roof over my head and for food on my plate. I am thankful for freedom in Jesus, and I am thankful and humbled that God thinks enough of my messy little life to give me what He does and to gently push me along the way. I don't need any more or any less. Just being yourself is a wonderful thing.